You can lose your teeth for a variety of reasons. It could be an accident, gum disease, a vitamin deficiency or any number of other reasons. If they are your back teeth, which are your molars, you may be inclined not to do anything about it because no one can see that they are missing. And this is true, no one does see it, but depending on the tooth that is missing it could change your facial features. The cheek may sag on that side of your face. But there are other problems that you may not even think of that can be caused by missing teeth. One of these problems is food. What Food Will I Have Trouble Eating? Remember that all of your teeth have a specific purpose. Some are for chewing, and some are for tearing. If these teeth are missing, you may have problems with certain foods. 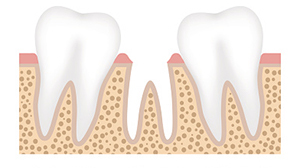 If one of the missing teeth causes a space between two other teeth, it will cause you a problem eating other foods. Here is what you may be missing out on. First off, there is crunchy food. It is difficult to chew crunchy food if you don't have teeth designed for chewing. Your teeth are set up to meet one another to do their job well. If one is missing, the tooth it is supposed to meet is basically out of commission as well. This makes it difficult to chew some cuts of meat and to eat just about anything that requires crushing, grinding or a lot of chewing. If you have a tooth missing between other teeth, you will lose out on other foods. These foods are a problem because they slide between other teeth. Foods like spaghetti will slide through, so will rice, nuts, and other small foods. If you have any questions, or if you would like to learn more, please call us today at (310) 894-8337.